Gloria here, today I want to share with you a card using a Grad cap die from Cheapo dies. 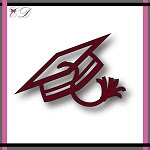 The Grad cap die is awesome and perfect for Graduation card! To create this card, I die cut the Grad cap twice. For first die cut, I used a black card stock and for second die cut, I used an orange card stock. I mounted it on top-folded card using double-sided tape, and then added some pink gemstones. Pretty~Pretty grad card Gloria, I love all the beautiful flowers, would make any grad so happy!! That is a beautiful graduation card design.